Nothing is more deeply ingrained in the newspaper industry than the definition of news. It’s the foundation of what we do, the “product” we use to attract and serve consumer audiences, and the platform on which we sell most of our advertising. Why start with the consumer’s daily information experience? Because that experience today is so drastically, almost unimaginably, different from 100 years ago, when our definition of news was largely conceived. With few exceptions, we are producing content every day that’s very similar to what we produced before the internet came into almost everyone’s life — before people could easily find and consume just about any information they wanted, anywhere, anytime. For me, that paragraph in Davis’ blog brought back a talk I heard about 25 years ago, when I was a member of TEC — The Executive Committee, since rebranded as Vistage — in Detroit. TEC/Vistage is an organization that forms CEO roundtable groups that meet monthly. The members counsel each other on issues that arise in their businesses, and the chairman brings in top-notch speakers who are experts on various aspects of running a business. My eight years in TEC were a profoundly important learning experience. The TEC speaker evoked by Davis’ blog — whose name I can’t remember — pointed out that successful businesses run on a cycle of birth, growth, maturity and decline. At the outset, the founder sees a need and conceives a product that meets it. The market responds, the business grows, and the company becomes successful. But after a period of success — usually after the founder is long gone — the business gradually softens and turns down. Sales decrease, revenues fall, and the management starts trying to figure out how to resuscitate it. At that point, he said, the business says, “We need to get back to what made us great.” Management looks back to the product as it was at the beginning and struggles to return to it by improving quality and redoubling sales efforts. That’s the wrong move, the speaker said. Instead of returning to the founder’s original product, the company needs to return to the original process by which the founder created the product. He or she began by gaining an understanding of what the customer needed and couldn’t get, then developed a product to meet that need. Twenty, 40, 60 or more years later, the customer’s needs are different, and the original product doesn’t meet current needs very well. What’s needed is a fresh process of learning what the customer can’t get done and creating a solution. Davis is urging publishers to do exactly that — to start out by understanding what information customers are now routinely getting — and from where, and when, and why — to understand what they are not getting and would welcome. Our customers today live in a world where most of the information they need is readily available. They consume larger and larger quantities of the information they want most. Within that diet of information, news remains a small but important element to many consumers, but it is being overshadowed by information that’s more relevant to them personally. Meanwhile, our industry remains focused on producing news as historically defined. No single “founder” defined news. But it’s sobering to realize that the definition was largely formed at the time of the great technological revolution that created our industry — the invention of high-speed, high-volume web press more than 100 years ago. The people who “invented” newspapers to fit that technology chose the content based on what would fit into a finite, once-a-day printed product and would be of greatest interest to the largest number of people. They called it news, and we still use that term today. How would “news” be defined today, when the information environment has changed so fundamentally? If we followed the wisdom of the TEC speaker, Andrew Davis and Clayton Christensen, we would start by spending time with consumers to observe and understand firsthand what information they are now consuming, as well has how and where. And, even more importantly, we would be trying to discover what they want and can’t find, or have trouble finding. Surely much of this is local, since that’s where our audiences live their lives. And that means our companies, whose strength is local, might be able to provide it. But news is only a small part of it today, and is sought out with much less urgency because it’s so easy to find. One way to solve this riddle would be to do a definitive enthnographic study, following closely the information-related behaviors of a sizable sample of consumers. And, just as important, asking what they wanted to find but couldn’t, or found difficult. I’m hoping maybe one of the organizations in our industry will undertake this type of study. In the meantime, I can point to a less direct way of seeing people’s current information behaviors. We’ve used this approach at Morris to understand where news fits into the behavior of people in our markets. I’ve referenced this chart before, but in the current context, it takes on more meaning. 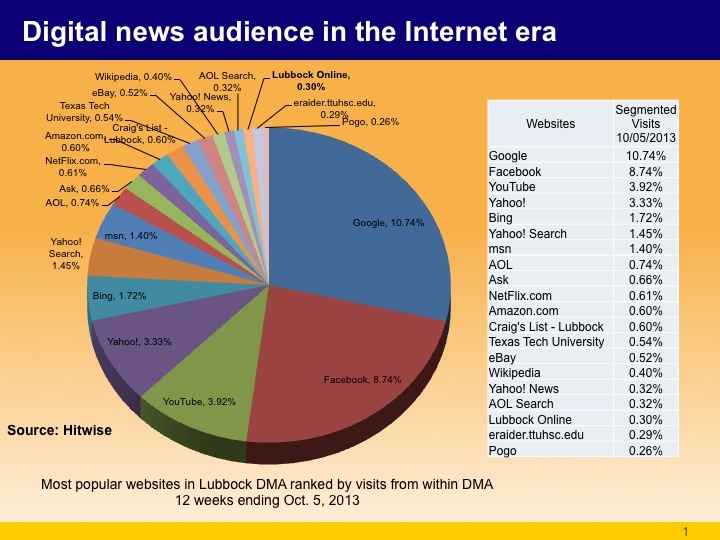 In effect, this chart shows how people in the Lubbock, TX, market behave in consuming digital information. (My company, Morris Publishing Group, publishes the Lubbock Avalanche-Journal.) We could say it’s the footprint of the average consumer. This chart is typical of our markets. It shows that we are the premier local news source, reaching more people than any other local news provider. But it also shows that we are far outranked — dwarfed — by other sites that Lubbock residents visit much more often than our Lubbockonline.com. In fact, Google gets 35 times as many local visits as we do. As an ethnographic indicator, this chart shows that people go to Google most often — presumably as a gateway to find whatever information they happen to need at the moment, which usually relates to something going on in their lives. They use Facebook to keep in touch with friends — 29 times as often as they visit us to get news. They visit YouTube to be entertained, Yahoo for news and personal interests, Bing and Yahoo Search as an alternative to Google for finding personally relevant information. They use MSN and AOL for non-local information and news, Ask.com to get answers to questions and problems in their lives, Netflix for entertainment, Amazon to buy stuff, Craigslist to buy stuff. And so on. All of these sites are used for personal interests and needs, and few of them are local. And, by the way, local businesses can buy advertising on most of these sites — and many do. That’s where a lot of the fast-rising spending on digital advertising is going. But now let’s get back to our core product: news. Don’t people have local interests and needs besides news? Every one of us knows that they do, because we, too, live in places and need lots of types of local information. If we did a real ethnographic study – and I hope we do – we could find out what they need. And we would almost certainly see that news by the old definition is still important but is only a small piece of the action. People want and expect far more today. Today, we need to realize that it’s not the old definition of news — the product — that’s sacred. What’s sacred is the process of discovering and providing the information that people in our markets most need in their lives and can’t get. Posted on February 18, 2014, in Audience, circulation, Content, Disruption, innovation, Media business model, News, Newsrooms, Uncategorized and tagged definition of news, digital content, digital era, ethnographic study, news, publishing. Bookmark the permalink. 3 Comments.